For a book with a title called Mastering Colored Pencil, I found the book to be lacking in tutorials that teaches you to master the medium. 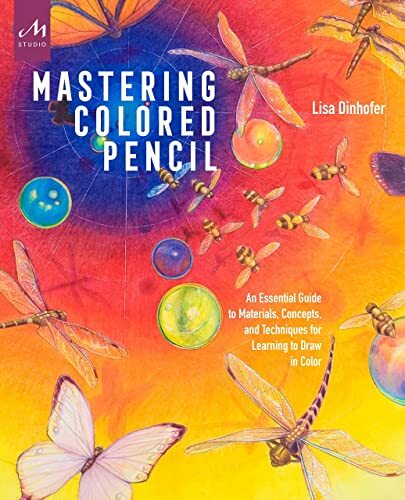 This book by Lisa Dinhofer is more of an introductory guide to coloured pencils. You'll learn about the tools you need, paper and types of pencils. The author uses Prismacolor by the way. Some colour theory is included. There are also instructions on how you can mix your own colours, create your own colour grids. The tips and techniques mentioned are elementary but the illustrated examples provided are very beautiful. You're a beginner so how are you going to be able to create those beautiful artworks shown? This book lacks step by step instructions and pictures. The book has plenty of examples that show you the potential of coloured pencils and the effects you can create with them, but it doesn't teach you how to apply what you've learn to create your own art. So after you've finished creating the colour grid, how are you going to use that to draw an apple? The book did not even go through how you're supposed to shade with coloured pencils. Sure it's foolproof to use a pencil, but there's actually a specific way to lay down the pigments so that your shading can look even and soft. That's by shading with your pencils in a circular manner. I can't believe that wasn't mentioned as well. So this book is good only as an intro to what coloured pencils are, and their characteristics. If you want really want to learn how to draw with coloured pencils, I recommend you check out other books, such as The Encyclopedia of Coloured Pencil Techniques by Judy Martin, Masterful Color: Vibrant Colored Pencil Paintings Layer by Layer by Arlene Steinberg or Colored Pencil Painting Bible by Alyona Nickelsen.